Spanish quartet Hinds – Carlotta Cosials, Ana Perrote, Ade Martin and Amber Grimbergenhave shared new track ‘The Club’ (premiered by Radio 1’s Annie Mac as the ‘Hottest Record In The World’) from the forthcoming album I Don’t Run, out Friday, April 6 on Pod via Inertia Music. The new album shows a bigger, better, faster, funnier, more dexterous Hinds. Co-produced by the band and Gordon Raphael [The Strokes, Regina Spektor], and mixed by Shawn Everett[Alabama Shakes, Perfume Genius, The War On Drugs], I Don’t Run is the product of a band fighting for their place, a band unwilling to rely upon their successes, a band who have just begun to prove themselves, and a band who plays hard but works even harder. Hinds’ breakout debut album Leave Me Alone may have been an album of party anthems drenched in metaphors, but with I Don’t Run, it’s time to cut right to the chase. Some might expect them to write songs about being happy, young and carefree – “but we’re not satisfied with that,” explains guitarist and co-vocalist Ana Perrote. “On this album the struggles are clear. We want to be brave.” I Don’t Run is Hinds’ return with an honest reflection on a period that changed their lives beyond their wildest imaginations. Since 2014, the band has been on a globetrotting run. They’ve never professed to being error-free, and they’re all the more brazen for it having survived everything that’s been thrown at them: world tours, sold-out crowds, harsh criticism, sexism, and all that lies in-between. Hinds have become better musicians, tighter friends and tougher characters. Hinds head to SXSW next week, followed by a co-headlining US tour with Albert Hammond Jr.
Over the weekend Spanish quartet Hinds – Carlotta Cosials, Ana Perrotte, Ade Martin and Amber Grimbergen – announced their long-awaited second record I Don’t Run. Out Friday, April 6 on Pod via Inertia Music, the new album shows a bigger, better, faster, funnier, more dexterous Hinds. Co-produced by the band and Gordon Raphael [The Strokes, Regina Spektor], and engineered by Shawn Everett [Alabama Shakes, Perfume Genius, The War On Drugs, John Legend], I Don’t Run is the product of a band fighting for their place, a band unwilling to rely upon their successes, a band who have just begun to prove themselves, and a band who plays hard but works even harder. To celebrate the announce, Hinds also share I Don’t Run’s first single, ‘New For You‘, with a music video that sees the band dominate the fútbol field. It features guitarist and co-vocalist Cosials practically screaming “Sometimes I see myself and I can’t stand my show!” before a pining chorus that sees her promise to be her best self for a lover (or perhaps for herself, or even her band of sisters). 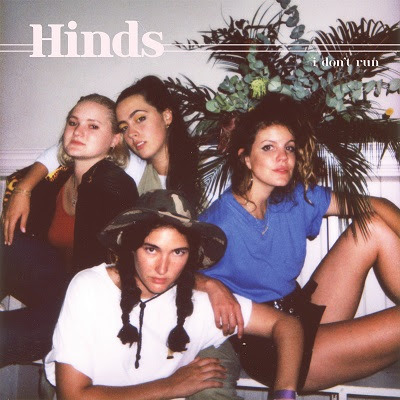 Beneath the breezy melodies lies a damning self-criticism; a side to Hinds we haven’t seen. They may play as dangerously as any male DIY act, but their reactions to sudden notoriety are imbued with sensitivity; a result perhaps of their inherent femininity, as opposed to a need to push their egos. 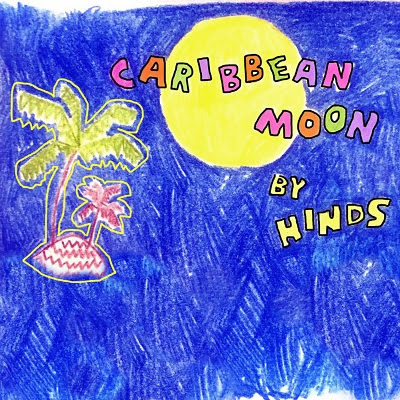 Madrid’s Hinds are back with a fun-loving cover of “Caribbean Moon”, originally a calypso-tinged 70’s gem by Kevin Ayers, of Soft Machine. In the vein of their previous cover and live favourite “Davey Crockett (Gabba Hey)” by Thee Headcoats, the Spanish quartet have injected some much needed vitality as we move into the move into the warmer months with “Caribbean Moon”.